The Canadian CML Network is a community of people living with Chronic Myeloid Leukemia. We are dedicated to providing emotional, social and educational support to people living with CML and their families. 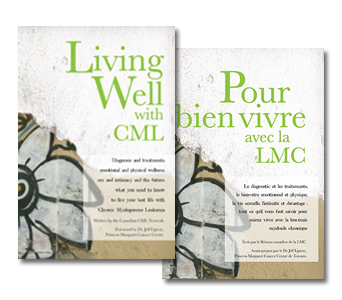 In 2014, the Canadian CML Network became a non-profit organization, after six years of providing support to the CML community. Although based in Toronto, the Canadian CML Network works with patients and healthcare providers from all across Canada, and is focused on building CML patient groups nationally so that no person living with CML ever has to feel that they are alone. Our heartfelt thanks to all those who have provided us with unwavering support, who have freely shared their advice and insights on how we can be the best we can be, and who have enthusiastically and unselfishly shared their time and expert knowledge over the years. We wouldn’t be able to do what we do without you. And most importantly, thank you to those in our community. Thank you for sharing your stories and experiences. Your honesty and openness about the challenges of living with CML have created a unique dialogue among patients and healthcare providers where there was none. At the same time, your stories of survival, resilience and life have given so many the courage to move through those dark days after diagnosis and look forward to the future. Together we are stronger.